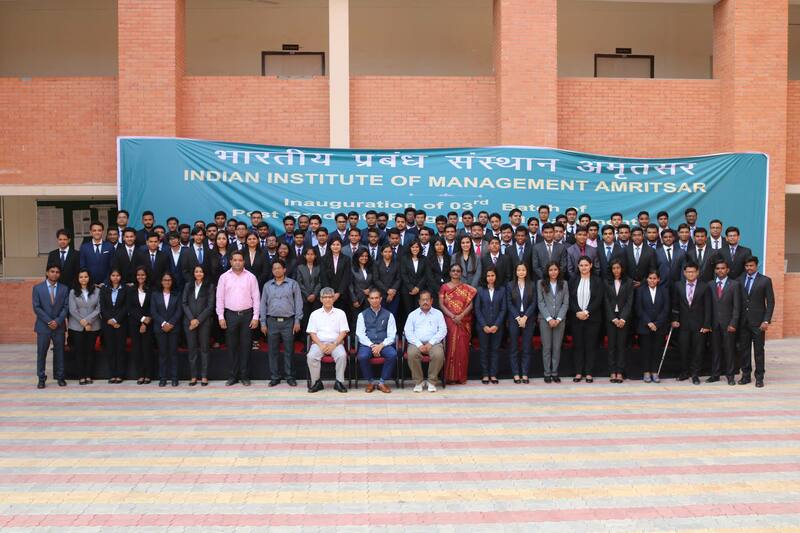 It was yet another proud moment in the academic history of Amritsar when the second batch of Post Graduate Program in Management was formally inaugurated at Indian Institute of Management Amritsar at a function organised in the Punjab Institute of Technology building, Government Polytechnic Campus, Amritsar, Punjab. The inauguration program began with traditional lamp lighting ceremony by the guest of the honour Mr. Rakesh Sharma Advisor, Former Senior Director – Marketing Phillips and a welcome speech by Prof. A.K. Swain, Nodal Professor IIM Amritsar. Prof. Swain took students and parents through the exciting one year journey of IIM Amritsar, presenting the numberless opportunities awaiting them at the campus. This was followed by the speech of Prof. M.P. Sebastian, Admissions Chairperson, IIM Amritsar. He acquainted the gathering with the rigors of the selection process and the growing popularity of the Institute. Prof Sebastian then read the profile of the new batch and mentioned that the new batch is very carefully selected which comprises of the 105 students from all over the country, coming from different disciplines including engineering, arts, science , business administration and commerce. The average work experience of the new batch is 55% in different industries like manufacturing, media, education, automobile, IT etc. Following Prof. Sebastian’s speech, Prof. SSS Kumar, Dean Academics, IIM Amritsar introduced the new batch with the objective of the PGPM. He emphasized that the purpose of the program is to develop bright, enthusiastic and highly motivated individuals into management leaders and change agents in the global arena. He noted that the participants’ with relevant industry experience would make the overall learning experience of the batch more interesting. He urged the participants to make the most out of this Programme and from their fellow batch-mates. Professor Kumar acquainted the participants with the course curriculum and schedule of the Programme. In his address, Prof. Kumar also appreciated the tireless efforts of Prof. Kulbhushan Balooni, mentor director, IIM Amritsar in building and nurturing the institute. Prof. Kulbhushan Balooni, Mentor Director, Indian Institute of Management Amritsar extended a warm welcome to the new batch of students and the guests. He was glad to inform that the Institute is emerging as the most desired destination for students among the new IIMs. He enumerated the institutes’s accomplishments and highlighted the various opportunities at the institute. He advised the new batch to be ambitious at the same remain focussed on addressing the local issues as well. The guest of the day Mr. Rakesh Sharma Advisor, Former Senior Director – Marketing Phillips began his speech by drawing parallels between the two states of life i.e. college and the corporate. He advised the students on striking out a balance between our needs and the expectations of the nation. He concluded by saying that the world is full of opportunities hence we should never lose hope at any point in life. The function concluded with the vote of thanks from the organizing committee of IIM Amritsar.